Cheap is a relative term. Every pop up camper is cheap, relatively speaking, when compared to other classes of RVs, but that doesn’t mean every pop up camper is affordable. Cheap pop up campers run the gamut from highly affordable tent-on-trailer units to slightly-less-affordable tent trailers (a-frames tend to be on the higher end of the “cheap” scale, but that’s a story for another post.) You can also stretch your dollar a lot more by looking at used pop up campers (so long as you’re careful to be on the lookout for leaks and other issues), and there are some great pop up campers that are only available used. The CWS8 is one of the cheapest hard-top pop up campers out there. 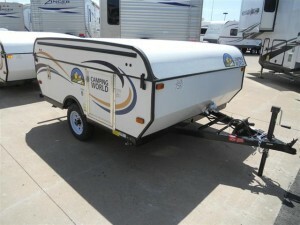 At the bottom of our list is the Coachmen Viking CWS8, which is one of the cheapest pop up campers you’ll find. The MSRP on this little pop up is $6,789 for the 2014 model, but you can find it advertised for shy of five grand. Of course, you can probably talk your way down from there if you care to. Is it really worth it, though? Let’s take a look at some of the vital stats. The CWS8 is essentially a re-badged Viking 1706LS, which Coachmen reports is just shy of 17 feet when opened and just over 12 feet when closed. That makes it one of the smaller pop up campers out there, although it does come equipped with a double bed in each of the pop outs, a dinette that converts into a bed, and a small kitchenette. At this price, you’re probably wondering if the CWS8 is junk, and the answer to that is going to depend largely on the particular Camping World that you happen to be dealing with. You see, Coachmen delivers these rigs to camping world stores, which do all of the finishing work before the unit is put up for sale. Some unhappy campers have reported less than stellar results, so be advised that you’ll want to do a thorough inspection before towing one of these off the lot. That said, the price is definitely right, so the CWS8 definitely belongs on any list of cheap pop up campers. Livin’ Lite makes some of the smaller, lighter pop up campers on the market, and the Quicksilver 6.0 is at the bottom end of their range. Although these campers don’t have hard roofs like other tent trailers, they are a little more substantial than your typical tent-on-trailer unit. Livin’ Lite also uses all aluminum construction materials, which is one of the reason that their campers are so lightweight. The Jay Series Sport 8 is the smallest pop up camper Jayco makes, and it clocks in at just shy of $6,000. Although this rig is in the same general price range of the Quicksilver 6.0, it’s bigger (eight foot box as opposed to a six foot box, which translates into a little less than 12 feet long when measured from bumper-to-hitch), and it also has a lot more sleeping space. Unlike the Quicksilver 6.0, and like the CWS8 and most other tent trailers, the Jay Series Sport 8 has two pop out tent sections. One bunk as a twin bed, the other has a full, and the camper also has a dinette that converts into a bed. As far as amenities are concerned, the Jay Series Sport 8 has the bases pretty well covered for a small rig. For the base price, you get an icebox, but there is an optional fridge. There is also an optional furnace, and the “customer value package” includes a carry-out indoor/outdoor stove. Although the Starflyer 10 doesn’t include a stove or fridge as standard equipment, like a lot of the other cheap pop up campers out there, Starcraft does provide a 5 gallon fresh water tank and a sink. 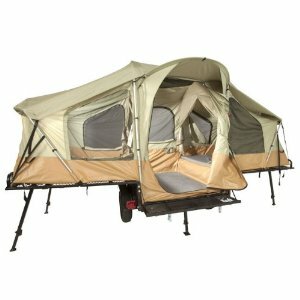 Lifetime makes some of the lightest cheap pop up campers around. While there are a lot of options out there for cheap pop up campers, it just doesn’t get any cheaper than Lifetime’s tent trailers. Unlike other tent trailers, these are more like trailers with tents on them (which is why we refer to this style of pop up camper with the term “tent-on-trailer” instead of tent trailer.) Price-wise, you’re looking at spending less than half as much on one of these as you would on the other cheap pop up campers on our list. Shipping included, you can buy a Lifetime Camping Trailer for less than $2,500. Style-wise, these campers are essentially cargo trailers with tents mounted on them, although it’s a little more complicated than that. When you set one of these units up, the trailer folds out to provide bunks just like other pop up campers provide, so there’s actually quite a lot of interior space. And since these units are a lot lighter than other pop ups (the base unit has a dry weight of just 700lbs), you can tow them with just about anything and bring along a lot more gear too. Although you can easily pay in the vicinity of $15,000 for a big, fully-appointed tent trailer or a-frame, it’s clear that most manufacturers offer cheap pop up campers that are much more affordable. These campers don’t all provide the same amenities (i.e., you’re not going to get a bathroom or air conditioning in a rig that sets you back less than six grand out the door), but there’s a tremendous amount of wiggle room on just about anything else. Looking for a lightweight pop up that falls on the cheap end of the spectrum? Well, both Livin’ Lite and Lifetime are represented on this list with campers that you can tow with a passenger car (or at least a crossover or light truck). More interested in plenty of sleeping space? Then something along the lines of our #2 (the Starflyer 10), is going to be right up your alley. (It’s tough to beat a queen bed, double bed, and dinette bed in a package that sets you back less than $6,000). Of course, you can always save a few bucks by looking for a dealer who still has old stock from the last model year, or check out used pop ups on ebay or craigslist. Any way you slice it, there are some great options out there for cheap pop up campers.